Presenting the second installment of my summer-to-fall transitional style featuring this blue blazer. 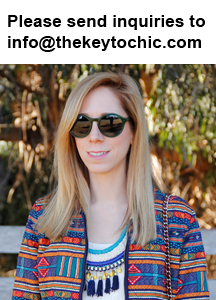 (See how I styled the jacket for summer.) You may know how deep my love for floral denim runs, and the dark, moody print on this pair makes them ideal for fall and winter when paired with layers. If you like my look, then click on over to cast your vote for me in the Wallis blogger contest, in which one very lucky winner will win a trip to New York Fashion Week. I'm at WWDMAGIC this week, so follow along with my adventures on Instagram and Twitter @thekeytochic for trend updates, mini fashion forecasting reports, and sneak peeks at spring collections!